Sunset's teachers are all certified in the field of early childhood. All teachers and aides are all certified for cpr and first aide. We are very thankful for the kind words. If you come here to visit, be sure to sign our guest book! In the winter we do "kinderkicks with Go No Sen"
Why choose Sunset Nursery School for your child's early education? Sunset is an academically strong, play with a purpose, Christian school. We are not a school of one faith, however, we celebrate different faiths and cultures and focus on the golden rule, "Doing to others as we would have them do unto you". We support the preschool Common Core program in a child-friendly and appropriate manner. The focus is on literacy and math skills using the Pre-K NYS common core program that compliments the NYS CC kindergarten program, so they are ready when they move on to the elementary school. Also, on a daily basis, they will enjoy art, dance, spanish, yoga, sign language, Go No Sen Kinderkicks, Minday Sax music, cooking, science and more! Our focus is on strengthening your child's God given talents, and we place a high emphasis on building independence, self esteem and individuality. With our 5 dynamic centers in the main room, the children have daily "free play". It is important to never underestimate the importance play has in a pre-school program. There must be an opportunity for center time play incorporated into their day. Play allows for creativity and the development of their imagination. 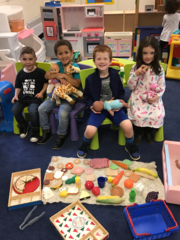 It teaches emotional control, appropriate social interaction and healthy brain development and it is an integral part of their early childhood experience. Math concepts at the preschool level are fun and easy to teach. For our little ones, math isn't just numbers. Math has many different dimensions in learning. Math is: Number sense using patterns and shapes. Measurements using amounts and distances. Language using more, less, adding, subtracting and equal. Spatial relationships using front, behind, near and far. At Sunset the children learn all of the above with "hands on" activities that keep them engaged and excited.